This French inspired delicacy resembles a pancake but on a much thinner scale. Crepes are great for breakfast, lunch or dinner. The nice thing about them is that you can have them either sweet or savory. Although, my husband will argue that they are always best when served sweet. I hope you enjoy this light and airy dish as much as we do. Prep: Begin by putting all ingredients into a blender. Pulse on medium speed for a minute or so, scraping the edges in order to mix well. Blend on medium speed for another minute and then set aside while you warm the crepe pan. Once pan is warmed to a medium heat, pour about 1/4 C of the crepe batter onto the center of the pan. While holding pan, rotate pan to make a thin layer of batter on the bottom of the pan. 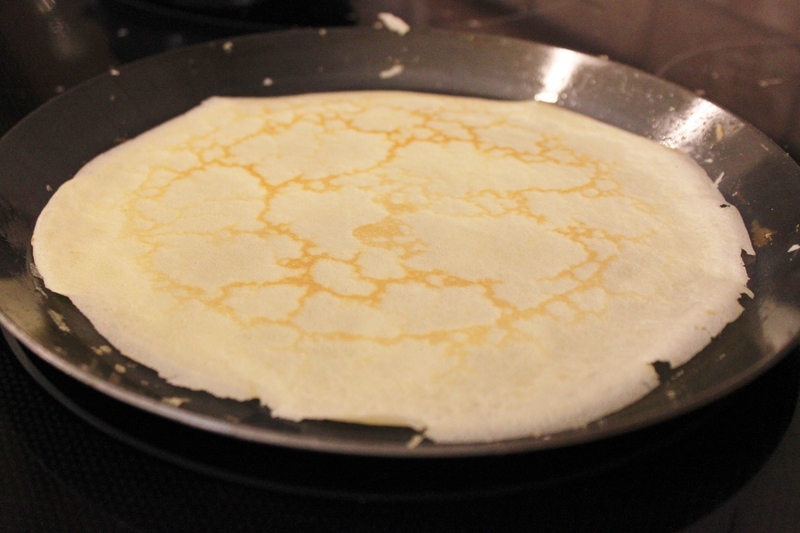 Continue to heat crepe for about 2 minutes or until edges begin to curl, flip crepe and allow the other side to cook for about 1 minute or until golden along the edges. I use wax paper to separate each crepe. You can serve these immediately with fruit and whipping cream, syrup or other desired toppings. If you choose, you can also refrigerate them for up to 24 hours or freeze them for later use. notes: If you think you will be making crepes at least a few times a year I would suggest using a crepe pan. They are much easier to use than a skillet and the crepes won’t stick to the bottom. Also, I love making savory crepes, crepe manicotti is one of our favorites. buy now: Williams Sonoma sells the crepe pan that I use, it is a quality pan but inexpensive. de Buyer Crepe Pan. … Thanks again to all you who are bearing with my inconsistent blog posts, I am starting to feel a little better and cannot wait to start cooking and baking more, especially without feeling nauseous. Have a great week! Welcome to Pantry Lane, where I share much of my heart, my passion for creating, my appreciation for food, my love for travel, and a bit of my daily life.